Charis Bible College (CBC) is all about people! Focused on educating the body of Christ about who God is and who He is in His saints. Charis Bible College is equipping the saints for the work of the ministry, training disciples to go out and share the Gospel with the rest of the world in the way God has uniquely called each individual to do it. Every believer is called to be a minister of Christ; some are called to pastor, some to evangelise, some to prophesy, but we are all, as believers, called to go forth and make disciples! We at Charis believe effective ministry can only happen when we understand who God is and what our relationship is with Him. Once we understand the grace and love of God and our identity in Him, we can make an effortless impact in our world! CBC Dewsbury has been operating for seven years now and recently welcomed new Directors Dieter & Anna Thamm. Dieter and Anna are CBC Walsall graduates from both the second and third year courses. 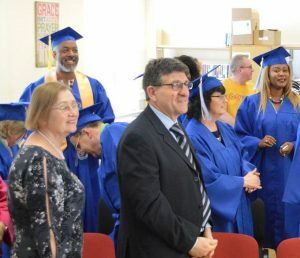 They have recently successfully graduated from the Directors Training Programme Internship whilst being employed by Andrew Wommack Ministries Europe. Dieter and Ana have been missionaries for over thirty five years serving in Eastern Europe, Tanzania and most recently Jordan. They bring a wealth of ministry experience and carry the heart of the ministry. We look forward to them leading and directing the college in this new season.